In his message for Lent 2017, Pope Francis reminded the faithful that they should heed the Scriptures and treat each human person they encounter as a gift. Scripture is also a gift, the Pope said in his message, which was released last October to help Catholics across the globe prepare for the 2017 Lenten season. In his message, Pope Francis reflected on the parable of the rich man and Lazarus. In that story, a poor man named Lazarus lives on the doorstep of a wealthy man who ignores him. When they die, Lazarus rests in paradise, while the rich man suffers. Although Lazarus is “practically invisible to the rich man,” Pope Francis said, we should see him as a concrete person, whom God views as a priceless treasure. In this way, the parable invites us to see each person as a blessing, he said, and Lent is a particularly fitting time to open our door to all those in need and the face of Christ in them. “For those corrupted by love of riches, nothing exists beyond their own ego,” the Holy Father warned. 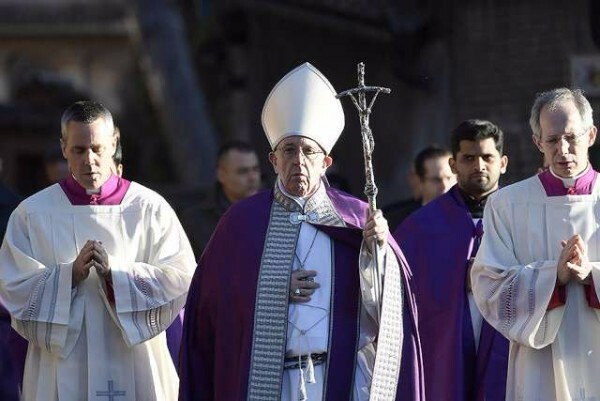 As we start the journey of Lent, with its emphasis on fasting, prayer, and almsgiving, we have a chance at a new beginning in our own lives, the Pope noted. “This season urgently calls us to conversion. Christians are asked to return to God with all their hearts, to refuse to settle for mediocrity and to grow in friendship with the Lord,” he said, adding that Christ waits for us patiently, ready to forgive us when we fall short.